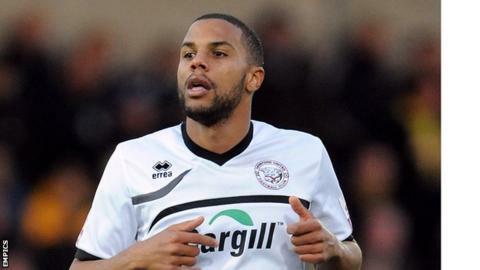 Hereford United staved off relegation with a crucial win over Alfreton Town. The away side opened the scoring through John Akinde but Hereford levelled when Kingsley James rounded the goalkeeper to score. The Bulls took the lead when Dominic Collins headed in Frankie Artus's corner and made it 3-1 when James picked out Jarrod Bowen who fired home. A nervous finish was set up when Akinde set up Shaun Harrad to finish but Hereford held on to record a vital win. Hereford go into the final game of the season against Aldershot needing a win and for Chester to slip up against Salisbury to avoid relegation from the Conference Premier. Match ends, Hereford United 3, Alfreton Town 2. Second Half ends, Hereford United 3, Alfreton Town 2. Hand ball by John Akinde (Alfreton Town). Attempt missed. Jonathan Brown (Hereford United) right footed shot from the right side of the box. Goal! Hereford United 3, Alfreton Town 2. Shaun Harrad (Alfreton Town) left footed shot from the centre of the box to the top right corner. Substitution, Hereford United. Cory Williams replaces Michael Rankine. Attempt missed. Daniel Bradley (Alfreton Town) right footed shot from outside the box misses to the left. Assisted by Josh Law. Attempt missed. Shaun Harrad (Alfreton Town) left footed shot from the left side of the box misses to the left. Attempt missed. John Akinde (Alfreton Town) right footed shot from outside the box misses to the left. Foul by Shaun Harrad (Alfreton Town). Rob Purdie (Hereford United) wins a free kick. Chris Westwood (Alfreton Town) wins a free kick. Kingsley James (Hereford United) wins a free kick. Michael Hoganson (Alfreton Town) wins a free kick. Substitution, Hereford United. Jonathan Brown replaces Jarrod Bowen because of an injury. Goal! Hereford United 3, Alfreton Town 1. Jarrod Bowen (Hereford United) left footed shot from the left side of the box to the bottom right corner. Assisted by Kingsley James with a cross. Andrai Jones (Alfreton Town) wins a free kick. Godfrey Poku (Alfreton Town) wins a free kick. Attempt missed. Godfrey Poku (Alfreton Town) right footed shot from outside the box misses to the left.